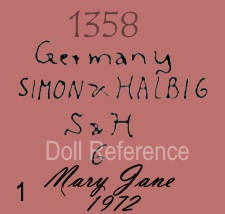 Simon & Halbig was founded in 1839, they began making dolls from 1869 in their two porcelain factories in Gräfenhain and Hidburghausen, near Thüringia, Germany. 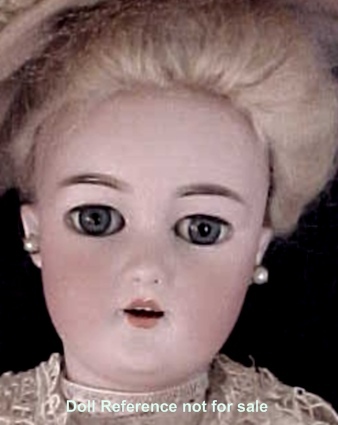 In 1920 S & H was bought by Kämmer & Reinhardt, who continued to produce dolls until 1932, shortly after the factory became known as Keramisches Werk Gräfenhain which ceased around 1943. 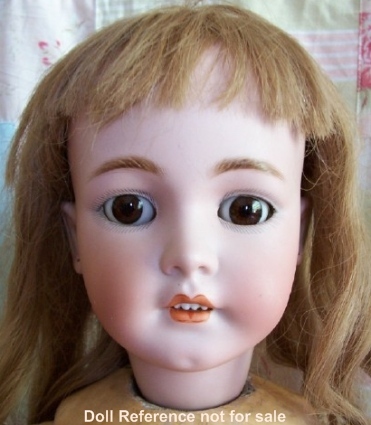 Simon & Halbig is known for their fine bisque doll heads and innovation in the doll industry, they also supplied doll heads to many other well known doll manufacturers. 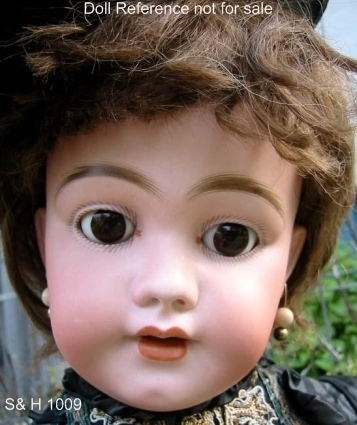 The American firms that used a S & H doll head; Arranbee, George Borgfeldt, Thomas Edison, Gimbel Brothers, FAO Schwartz, John Wanamaker. German firms; Bawo & Dotter, C.M. Bergmann, Bing Brothers, Carl Bergner, Cuno & Otto Dressel, Eekhoff, Hamburger & Company, Heinrich Handwerck, Adolf Hülß also spelled Hülss, Kammer & Reinhardt, Louis Lindner & Sohn (doll mark LL & S), Franz Schmidt, Schoenau & Hoffmeister, Strobel & Wilken, Carl Trautmann (see Catterfelder Puppenfabrik), Wagner & Zetzsche, Welsch & Company, Hugo Wiegand, Wiesenthal, Schindel & Kallenberg, Adolf Wislizenus. French firms; Fleischmann & Bloedel (or Blödel), Jumeau, Roullet et Decamps and SFBJ. 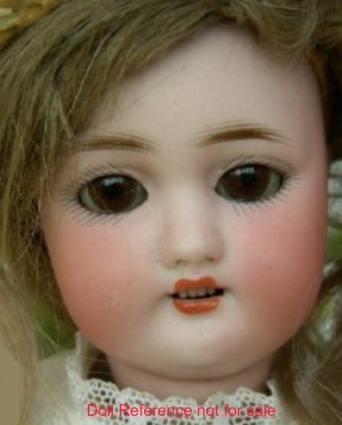 S & H Character face, Child doll mold 151, 14 or 23" tall, bisque head with intaglio eyes, open smiling mouth with teeth, cheek dimples, wigged, jointed composition body. 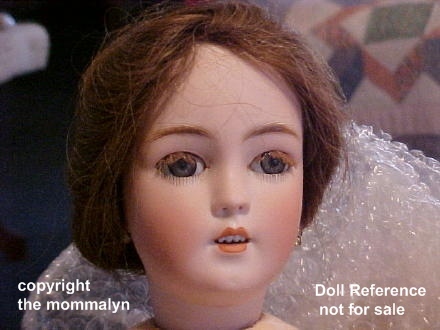 Photo courtesy of themommalyn, doll is an artist reproduction of the S & H doll mold 151. 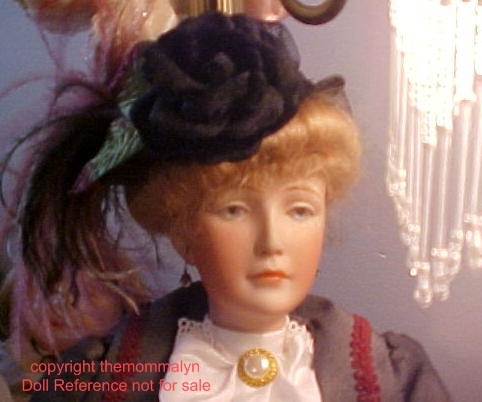 S & H Character face, Lady doll mold 152, 18 or 24" tall, slender oval face with painted eyes set under molded eyelids, long slender nose, closed mouth, wigged, composition jointed lady body. Very pensive looking face. 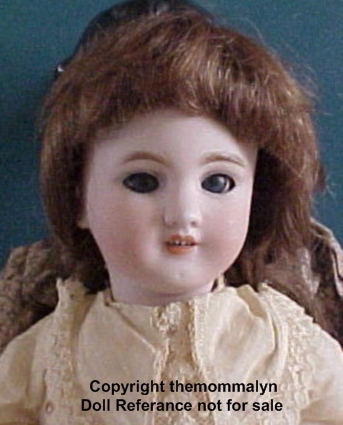 S & H Character face, Child doll mold 949, 16, 20 & 24" tall, bisque head, composition jointed body, glass eyes, closed mouth. ca. 1889-1920s S & H Character face, Child doll mold 1009, 16-29" tall, bisque shoulder head, wigged, sleep glass eyes, feathered eyebrows, open mouth, pierced ears, composition ball jointed body, S & H doll mold 1009 doll shown is 29" tall. S & H Character face, Child doll mold 1039, 16, 16 - 24" tall, bisque socket head, glass eyes, open mouth, composition jointed body. size 7-42" tall, bisque socket head, wigged, sleep glass eyes, feathered eyebrows, pierced ears, open mouth, jointed composition body. 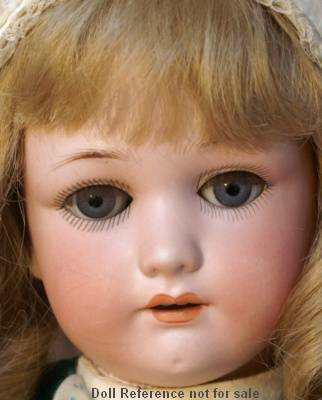 S & H Dolly face, Child doll mold 1079, 7-42" tall, bisque socket head, glass eyes, open mouth, pierced ears, composition jointed body. Doll molds; 540, 550, 570, 1078, 1079 & Baby Blanche - are all Dolly Face socket heads. 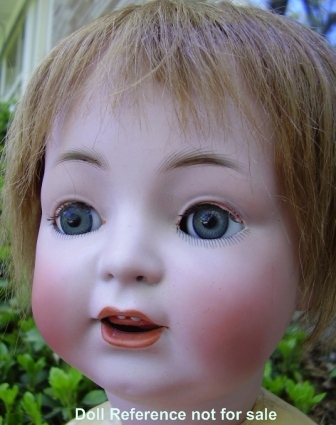 14-30" tall, bisque shoulder head, on a kid body, bisque arms, glass eyes, open mouth, pierced ears. Dainty Dorothy. Molds; 1040, 1080, 1250, 1260 - are all Dolly Face shoulder heads. 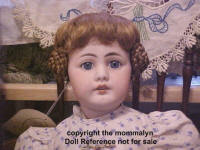 S & H Dolly face, Child doll mold 1109, 14" tall, bisque head, glass eyes, open mouth, pierced ears, composition jointed body. 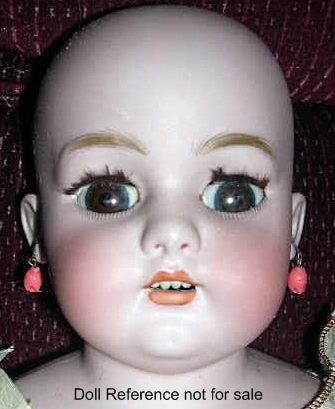 S & H Oriental face, Child doll mold 1129, 14" tall, bisque head, glass eyes, open mouth, pierced ears, composition jointed body. ca. 1910 S & H Lady doll mold 1159, bisque socket head, glass sleep eyes, open mouth, pierced ears, Lady body with molded breasts, slim arms & legs, body is marked H. Handwerck. 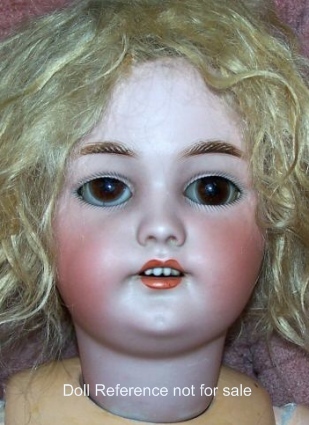 21" tall, bisque socket head, glass sleep eyes, open mouth, pierced ears, Lady body with molded breasts, slim arms & legs, body is marked H. Handwerck. 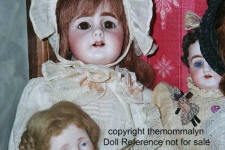 The S & H closed mouth doll mold 1160 is known as Little Women. S & H Santa doll mold 1249, 28" tall, bisque socket head, glass eyes, feathered brows, pierced ears, open mouth, composition jointed body. 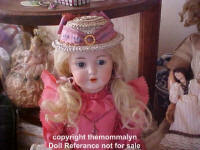 Doll mold 1248 or 1249 are both Santa dolls with bisque socket heads. 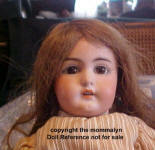 S & H Dolly face, Child doll mold 1279, 12 - 24" tall, bisque head, glass eyes, open mouth, pierced ears, composition jointed body. 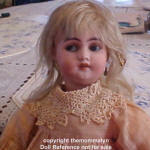 12 - 24" tall, bisque head, glass eyes, open mouth, pierced ears, composition jointed body. S & H Dolly face, Child doll mold 1310, 24" tall, bisque head, glass eyes, open mouth, composition jointed body. S & H Dolly face, Child doll mold 1339, 12 - 24" tall, bisque head, glass eyes, open mouth, pierced ears, composition jointed body. Doll mold 1339 plus the initials LL & S are for Louis Lindner & Sohn. 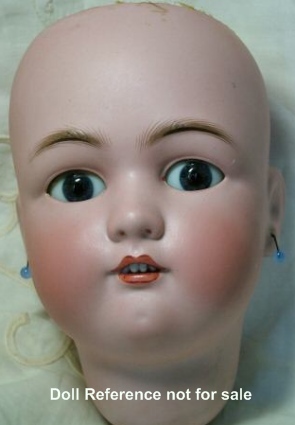 head, glass eyes, closed mouth, pierced ears, composition jointed body. 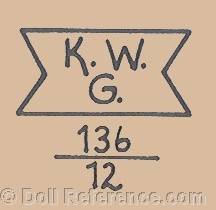 Jutta doll molds are either 1348 or 1349. 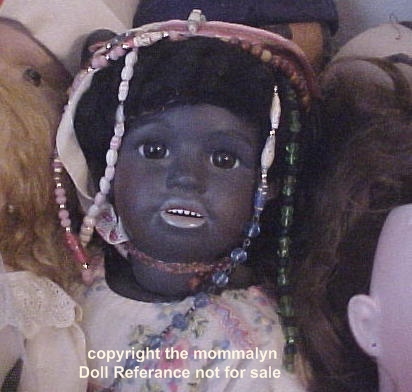 S & H Dolly face, Child black doll mold 1358 12 - 24" tall, bisque head, glass eyes, open mouth, pierced ears, composition jointed body. 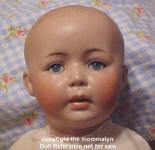 S & H Baby doll mold 1498, solid dome head, 16 - 22" tall, bisque head, glass eyes, open/closed mouth, composition jointed body. 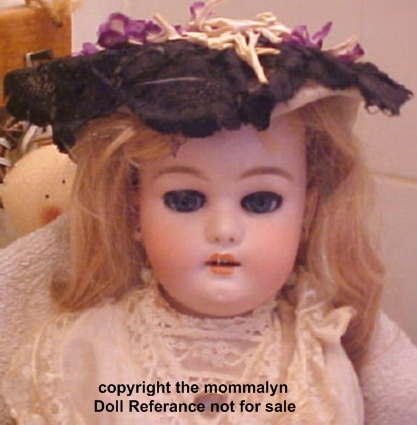 S & H Flapper Doll, 13" tall, bisque head, sleep glass eyes, pierced ears, open mouth, composition jointed body including knees, high heel feet. 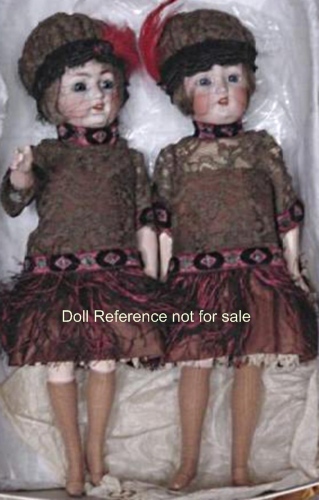 S & H Twin Flapper Dolls, 13" tall, bisque head, sleep glass eyes, pierced ears, open mouth, composition jointed body including knees, high heel feet. 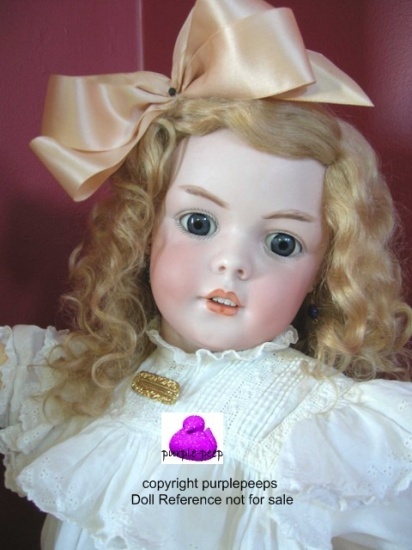 Thanks to themommalyn, purplepeeps & ragdolls for sharing your beautiful doll photos & expertise to create this page.